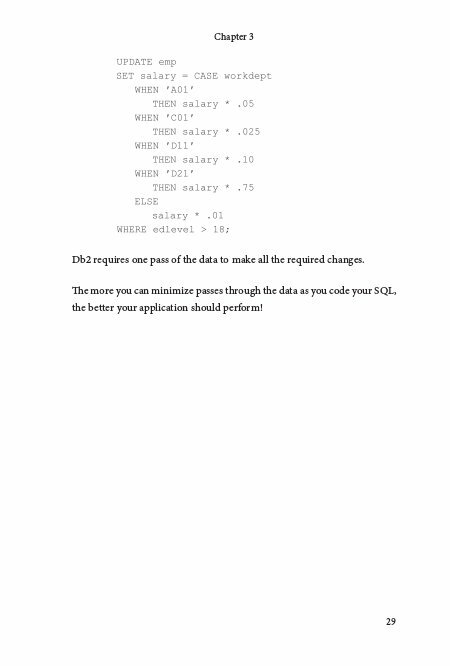 A Guide to Db2 Performance for Application Developers will make you a better programmer by teaching you how to write more efficient application code to access Db2 databases. 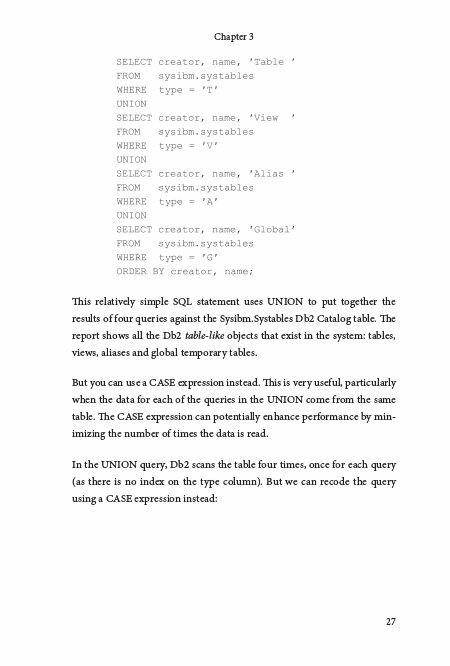 Whether you write applications on the mainframe or distributed systems, this book will teach you practices, methods, and techniques for optimizing your SQL and applications as you build them. Write efficient applications and become your DBA's favorite developer by learning the techniques outlined in this book! The purpose of this book is to give advice and direction to Db2 application developers and programmers on writing efficient, well-performing programs. 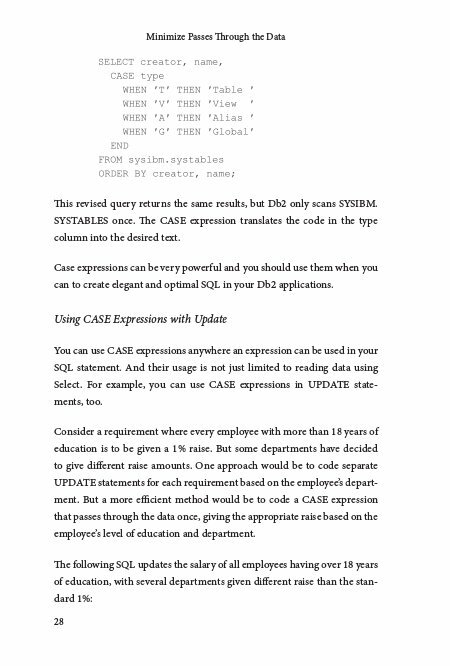 If you write code and access data in a Db2 database, then this book is for you. The methods outlined in this book will help you improve the performance of your Db2 applications. The material is written for all Db2 professionals, whether you are coding on z/OS (the mainframe) or on Linux, Unix or Windows (distributed systems). When there are pertinent differences between the platforms it is explained in the text. The focus of the book is on programming, coding and developing applications. As such, it does not focus on DBA, design, and data modeling issues, nor does it cover most Db2 utilities, DDL, and other non-programming related details. 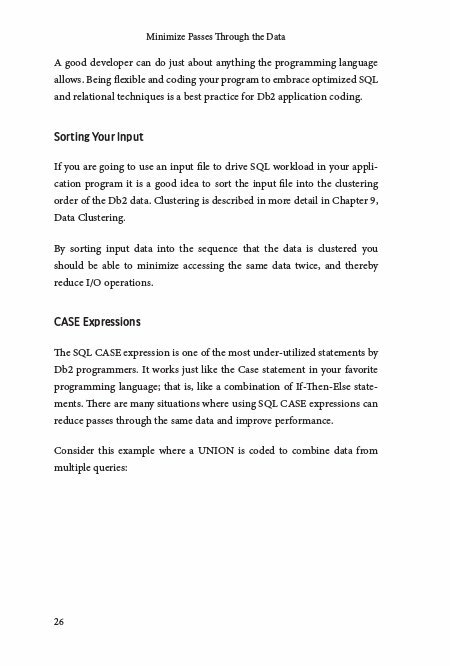 If you are a DBA, the book should still be of interest to you because DBAs are responsible for overall Db2 performance. Therefore, it makes sense to understand the programming aspect of performance. It is important also to understand that the book is not about performance monitoring and tuning. These activities are important, but are typically not the domain of application developers. 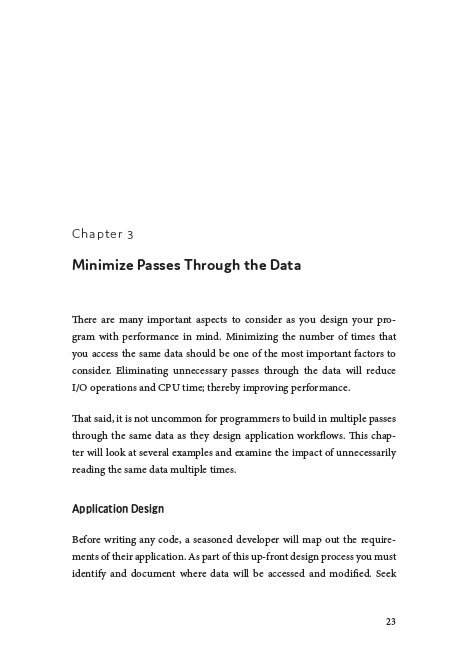 Instead, the book offers guidance on application development procedures, techniques, and philosophies. The goal of the book is to educate developers on how to write good application code that lends itself to optimal performance. 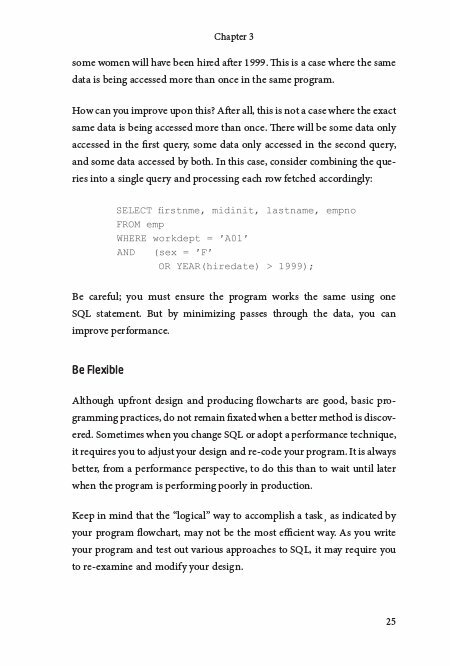 By following the principles in this book you will be able to write code that does not require significant remedial, after-the-fact modifications by performance analysts. If you follow the guidelines in this book your DBAs and performance analysts will love you! 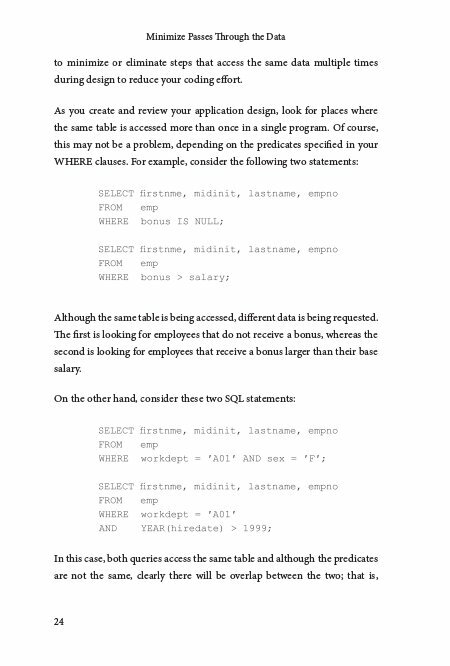 The assumption is made that the reader has some level of basic SQL knowledge and therefore it will not cover how to write Db2 SQL code or code a Db2 program. It is also important to point out that the book does not rehash material that is freely available in Db2 manuals that can be downloaded or read online. Craig S. Mullins is president and principal consultant of Mullins Consulting, Inc. where he focuses on data management, performance, and strategic consulting. He has been named by IBM as a Gold Consultant and an IBM Champion for Analytics. Craig has experience working as a programmer/analyst, a DBA, an industry analyst, a software executive and a consultant. Craig has over three decades of experience in all facets of database systems development and has worked with Db2 since V1. Craig writes the monthly DBA Corner column for Database Trends & Applications magazine. You also may know Craig from his other popular books, including the best-selling "DB2 Developer's Guide", and "Database Administration," his book on DBA practices and procedures.